Information for those who care. Once again, out on a run, I was reminded that patience is needed. Yes, for the runner, but let me add, everyone who uses the roads. I’m not the only one in this position, but as a runner, cyclist, motorcyclist and driver, I have an interesting perspective on road use and it all comes down to patience. I see it everyday. You do too, I’m sure. 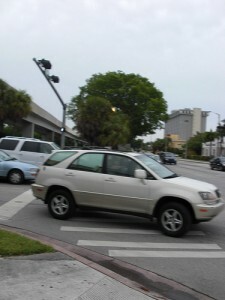 At the four-way stop, the impatient driver. Or the guy coming out of the parking lot. Maybe its the cyclist blowing through the stop sign, or the motorcyclist blowing by you, crossing the double-yellow. All of these scenarios happen everyday, and they’re all very dangerous. The one that had been noticeable lately is the tendency for drivers to pull across a sidewalk, or crosswalk without looking to the right. Only caring about the on-coming traffic. As a runner, we’re supposed to run against traffic, whether on the sidewalk or street. It’s safer. Hopefully, it makes me more visible, it allows me time to see you and make adjustments, as opposed to running with traffic where I don’t know you’re there and don’t see me until you run me down. I know, gruesome. However, running against traffic means that when a driver doesn’t look to their right before pulling through the crosswalk or driveway, they don’t see me running towards them. So here’s my list of things for all road users to consider. Drivers, look both ways when approaching a crosswalk/driveway, don’t just blow through it to the street. It takes a lot more energy for the runner to stop and wait for you to hit the gas pedal then start again, then it does for the driver to wait the extra 15 seconds before using your right foot to press the gas pedal. Let the runner cross. Give cyclists 3 feet when passing. Not only is it the law in many places, but your car might get scratched. As a runner or cyclist, don’t press your right of way. You’re out getting exercise, so an extra 15 seconds ain’t gonna kill you, while the car might. Stay on your side of the road. Those yellow lines are there for a reason. If you can’t stay in your lane, you’re going to fast. If you can’t see around a curve, assume there’s an obstacle there. If there isn’t, great! If there is, then you just saved yourself and maybe others. Runners, run against traffic flow. Cyclists, cycle with traffic. All of these can be summed up with, be patient. It’s worth it. Do you have any other rules of the road to consider? Wethington Family Blog is proudly powered by WordPress and the SubtleFlux theme.